The first signs of summer are everywhere. Mother’s Day is almost here. It’s the perfect time for all kinds of great video productions, from thoughtful final projects to bittersweet end-of-year graduation montages. This month’s newsletter is packed with things to keep your students engaged and the inspiration level high. There’s an amazing deal for FREE WeVideo, our incredible new Motion Titles feature, and much, much more. This month we also introduce teacher and WeVideo expert Bruce Reicher. Bruce is a 20+ year teaching veteran, school board member, and state and national conference speaker. Want to know what happens when this seasoned educator and iMovie expert was confronted by his district’s sudden move from iPads to 1:1 Chromebooks? Read the story of his rapid transformation into WeVideo Ambassador and his efforts to push digital storytelling into every classroom. One of WeVideo’s most eagerly anticipated new features is here! Check out this great video to see what Motion Titles are all about and then create or login to your WeVideo account to get started. For a limited time, WeVideo is providing the rest of the 2016/2017 school year and Summer free when you book a new license for the upcoming 2017/2018 school year. Don't delay, this deal ends May 15th. 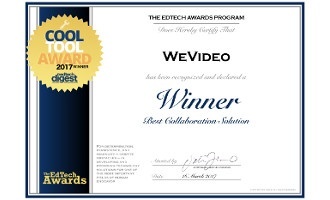 Collaboration is at the heart of WeVideo, so we were thrilled to be singled out for the 2017 EdTech Digest Cool Tool Award. Why WeVideo? 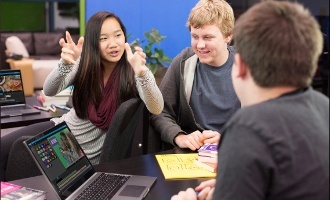 Check out what EdTech Digest’s editor-in-chief had to say. The Google Creative Apps for Chromebook program featuring WeVideo is now available to schools in the UK and Nordic countries. For details on the specially priced bundle of Chromebooks and WeVideo, as well as participating resellers visit here. ISTE 2017: WeVideo will be at ISTE in San Antonio from June 25-28 with a green screen, very special fun giveaways, and swag. Make sure to stop by booth #3045 to meet the WeVideo team and get a very special surprise! New Education Web Pages and Pricing: We’ve been hard at work redesigning our education pages with a fresh new look, better and more up-to-date information and resources, and easier access to the support you requested. We’ve also introduced a new entry price starting at only $199/year for a 30 seat WeVideo for Schools license. More details can be found here.